It's time for a change in America, but not without a few parting words from the 43rd President of the United States. 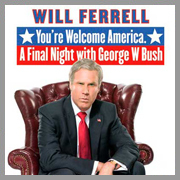 Emmy Award and Golden Globe® nominee Will Ferrell helped Broadway audiences examine the man behind the myth, the truth behind the lies, and the logic behind the illogical, in the outrageous You're Welcome America. A Final Night with George W. Bush which began performances on January 20, 2009 – President Bush's final day in office – and played a limited eight-week sold-out run at the Cort Theatre through March 15, 2009. The show was nominated for a 2009 Tony Award as "Best Theatrical Event” and the live HBO broadcast of the production was nominated for three 2009 Primetime Emmy Awards.